An electronic trailer module or relay (where applicable. This will be suitably designed and developed around the vehicle technological requirements. 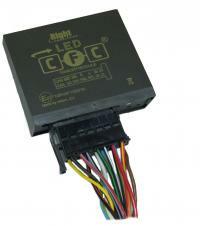 Modern vehicles have developed an ECU based indicator function. This means that the old style flasher unit no longer exists in these vehicles. In order for the driver to be notified of Trailer indicator failure, the trailer module is positioned in the harness and unlike the universal buzzer solutions, this will often be able to warn the driver of a flasher bulb failure on the trailer by activating a double flash frequency of the car indicators. This gives you the total confidence that, again unlike Universal electrics, an indicator bulb failure is monitored in ACCORDANCE WITH THE REQUIREMENTS OF TOWING LAW. CAN-Bus modules we use in our wiring kits are also programmed to activate bulb failure systems and this can also incorporate the activation of a bulb warning symbol, bulb or even a text message within the driver instrument display. In the majority of cases, it is an advantage that the Right Connections towing kits are enabled with vehicle fog lamp cut-off as standard. This is a HUGE advantage for the motorist who happens to drive in foggy or low visibility conditions. However, on a number of vehicle makes and models, this is not possible due to the technical system of these particular vehicles. Although it is not a legal requirement for vehicles in the UK to have cut-off enabled when towing, the glare reflected by the front of the caravan or trailer can extremely distracting, so whenever possible, we will ensure the vehicle rear fog lamp i deactivated when towing.Cut-off is either by mechanical means through the towing socket, an electrical method using a module, or the car is ‘programmed’ via diagnostics. Mechanical – The fog light feed is broken with either a sprung loaded metal strip or a microswitch, which is housed inside the socket. The insertion of the plug into the socket creates the contact break. Electrical – With this method, the contact is broken by the use of a relay which is prepared in the harness and breaks the circuit when it detects a fog light fitted on the trailer being switched on. The relay is mounted in the vehicle.